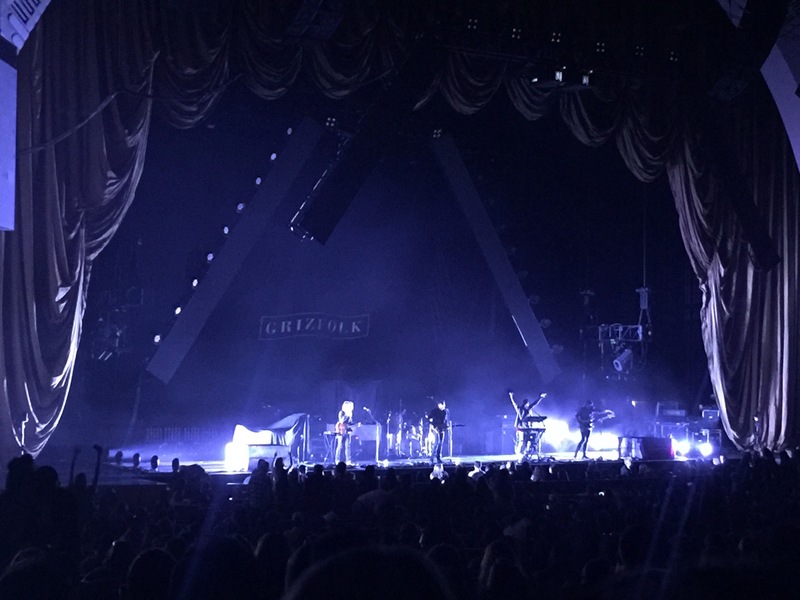 This past Friday, Justin and I had tickets to go see Bastille at Radio City Music Hall in the city. Originally, I was supposed to run late at work, so we didn’t have dinner plans, as we were going to just grab a quick bite and go straight to the show. But my plans changed, and I wound up getting home by about 3:30, with plenty of time to do a full dinner. There began the planning of what would soon become my all time favorite meal, to date. 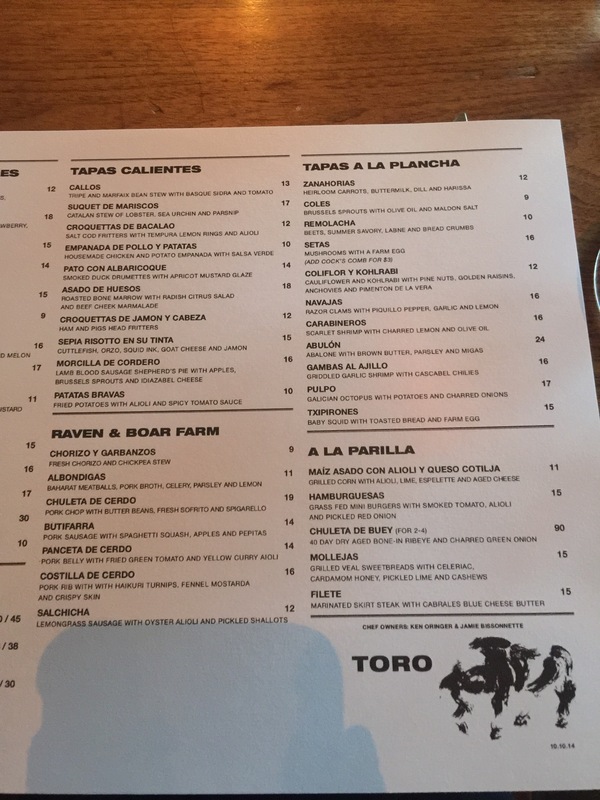 I looked quickly through my Yelp bookmarks, which reminded me of Toro. 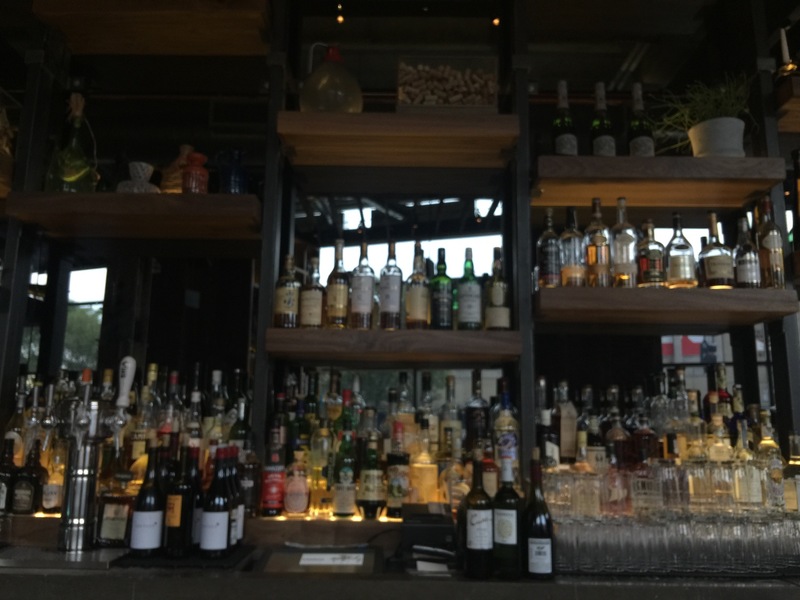 I checked out Opentable, and grabbed a 5:30 reservation, and we headed out, really not knowing what to expect. On the drive into the city Justin and I were both overwhelmed by the extensive list of outrageous menu items that our mouths watered over. How would we decide? 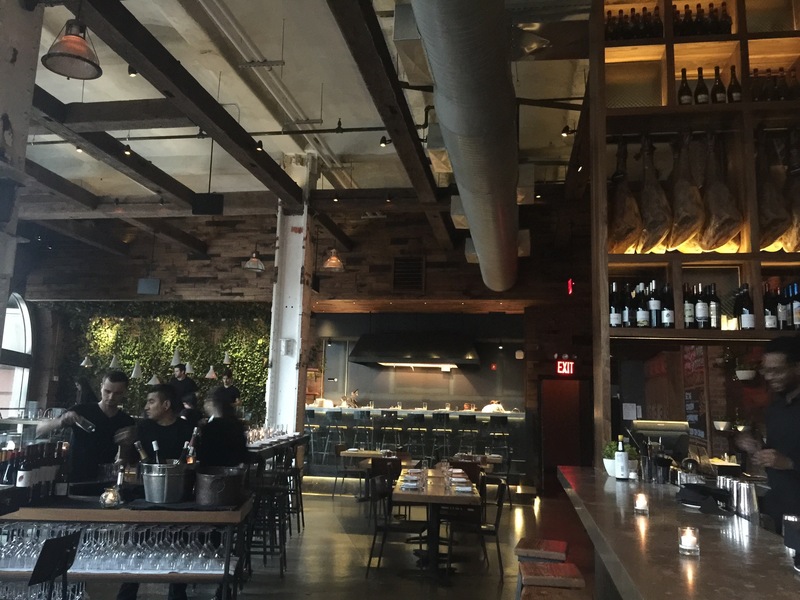 We arrived, and I immediately loved the decor: a mix of industrial (with high ceilings and exposed duct work) and rustic (with dark wooden finishes and lighting). As we were a few minutes early, we sat at the bar and ordered our drinks, first. 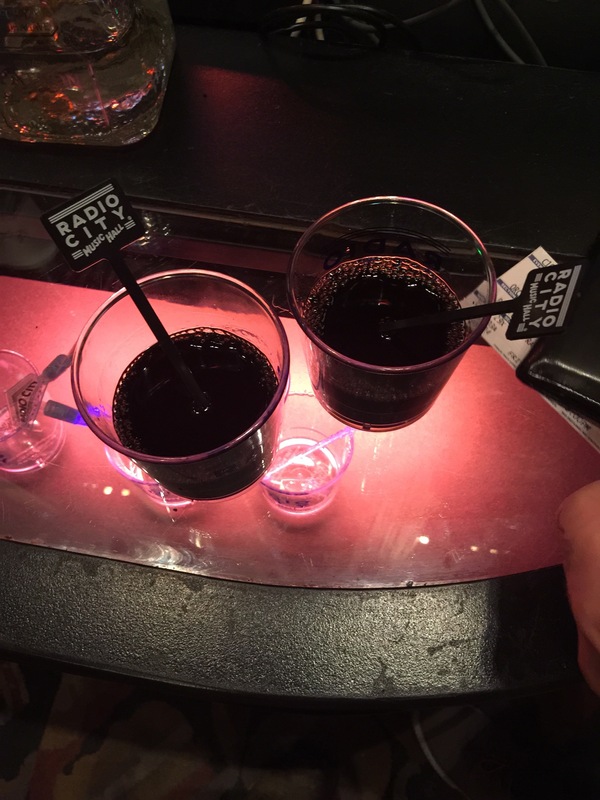 Our table was ready before our drinks even arrived, and our tab was easily transferred to our table. To drink, I went with the velvet campfire (so smokey because of the mezcal, extremely unique and delicious), and Justin went with the battle of Bartolome (a more traditional tasting drink, somewhere between a Manhattan and old fashioned, with an unusual freshness from the pear bitters). 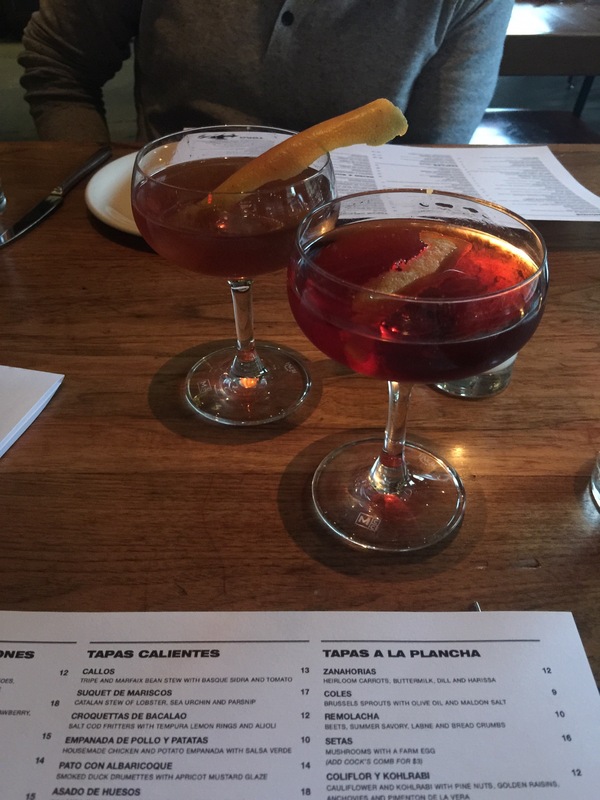 Both of these drinks were glorious. Then came time to browse the menu and start making the tough decisions. 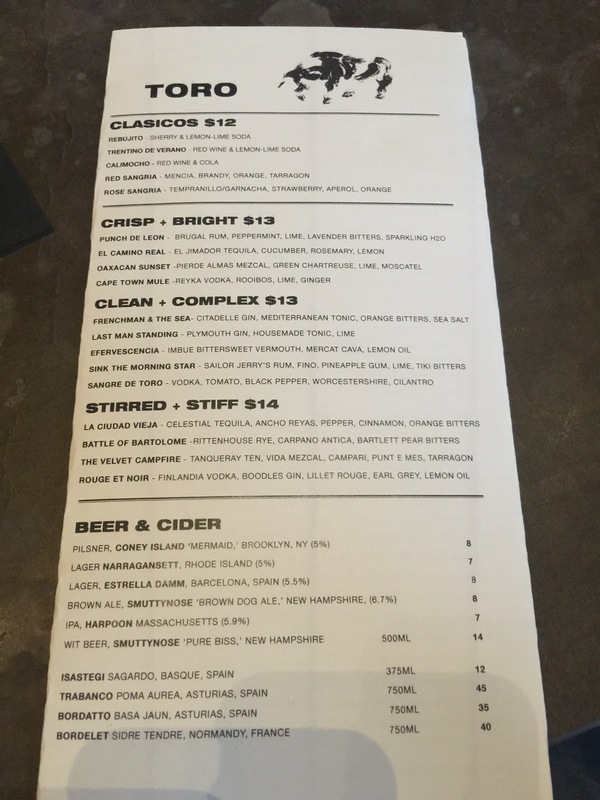 Do you see that menu? Do you see the amount of wacky crazy dishes we had to choose from? It was overwhelming at first. But our waitress was so friendly and helpful, informing us that typically 2-4 dishes per person is what is suggested. 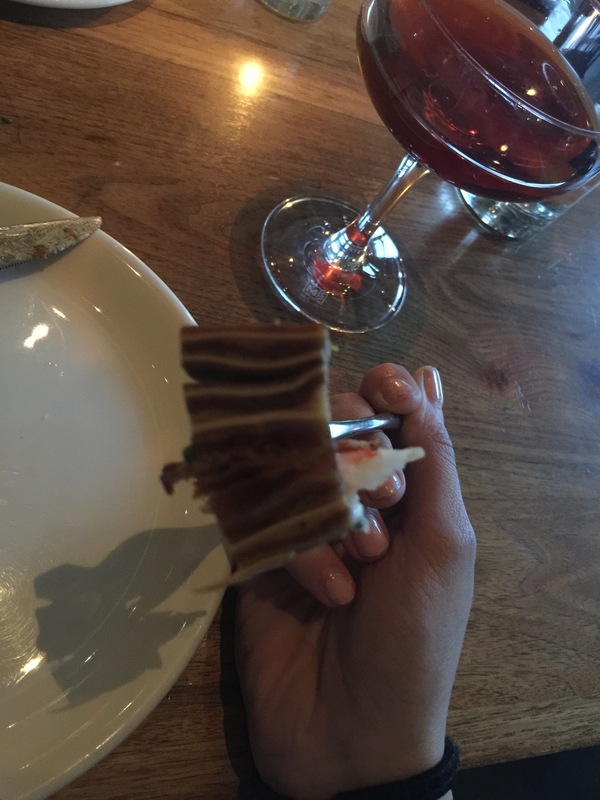 She gave us a list of some “must haves,” including the bone marrow and foie gras, and we took her advice. Below, find a picture of each mouth watering dish, along with a brief description. 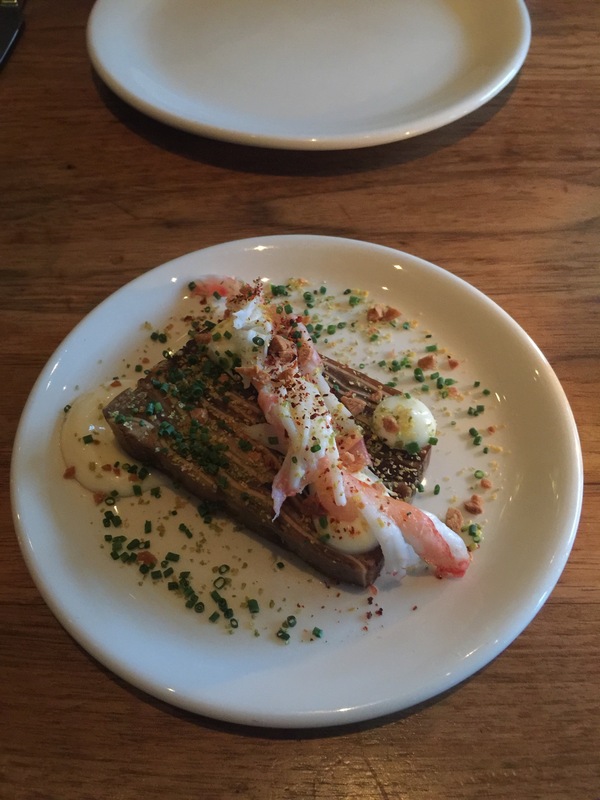 Above is the pig ear terrine: an unusual rubbery texture, that somehow still tasted amazing; it was visually beautiful to look at, with the layers of fat and meat stacked perfectly. The roasted herbs and garlic on the side and king crab on the top multiplied the flavors. This dish was perfect. Next came the corazon: smoked beef heart. I don’t think I’ve ever had heart before (it was so exciting to be able to find new things to taste for the first time), and was a little nervous about the texture, but it was amazing. The meat was shaved so thin, and was so easy to chew, with a heavy smokiness. This dish was perfect. Perfect dishes were a theme of this meal. This is the foie gras. 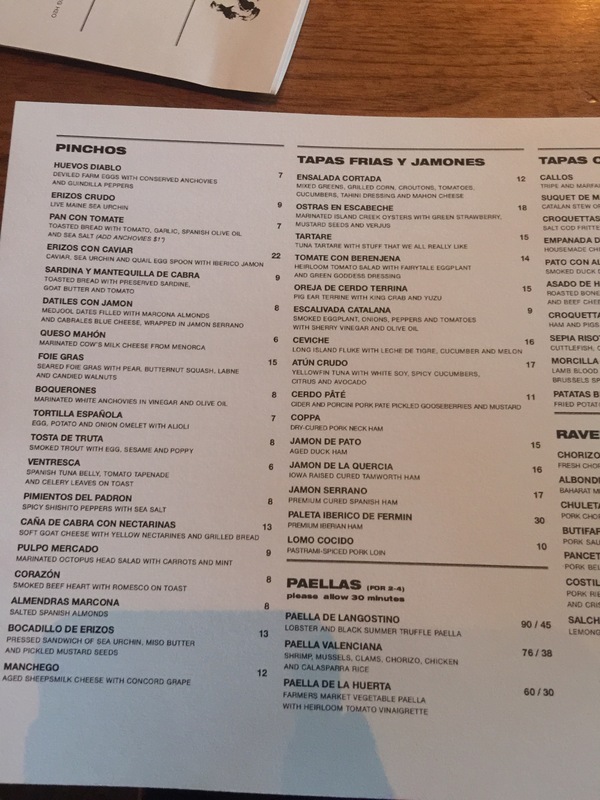 Both the beef heart and foie gras came from the “pinchos” column of the menu, so I expected tiny little tastes, but both dishes were substantial enough to get a few bites from. 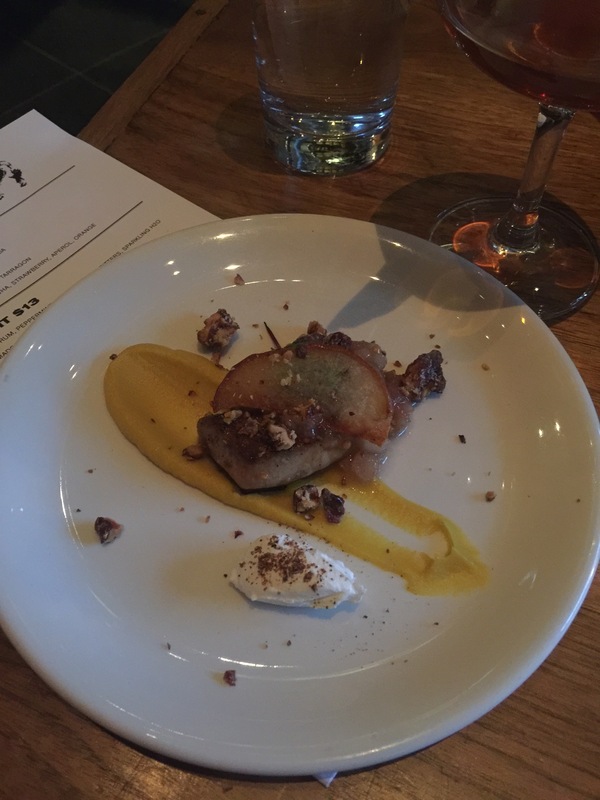 The foie came with a butternut squash puree, pear, and candied nuts. It was the best combination of flavors I’ve ever had with foie gras. Perfect, yet again. 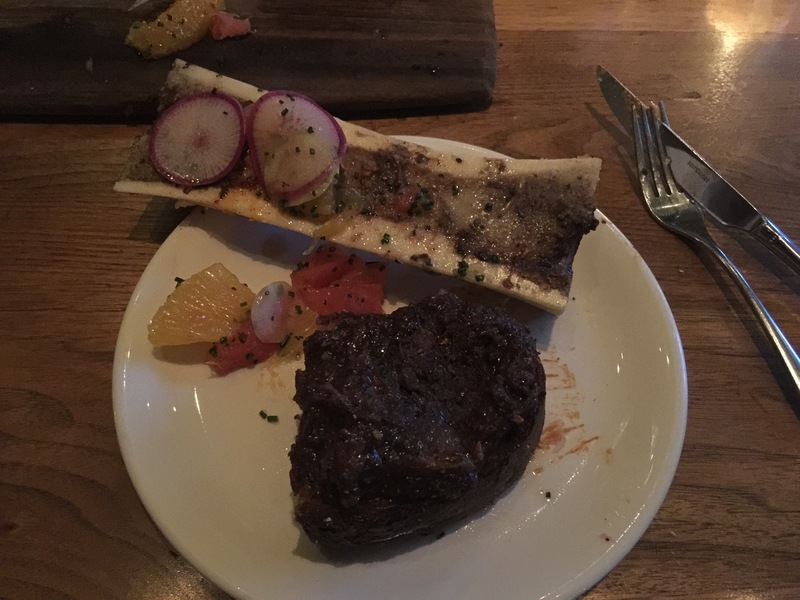 Next was the bone marrow. This is something I’ve had several times before, but never like this. Of all the bone marrows I’ve tasted, this was by far the best. And possibly my favorite dish of the entire night (although it is SO hard to decide). 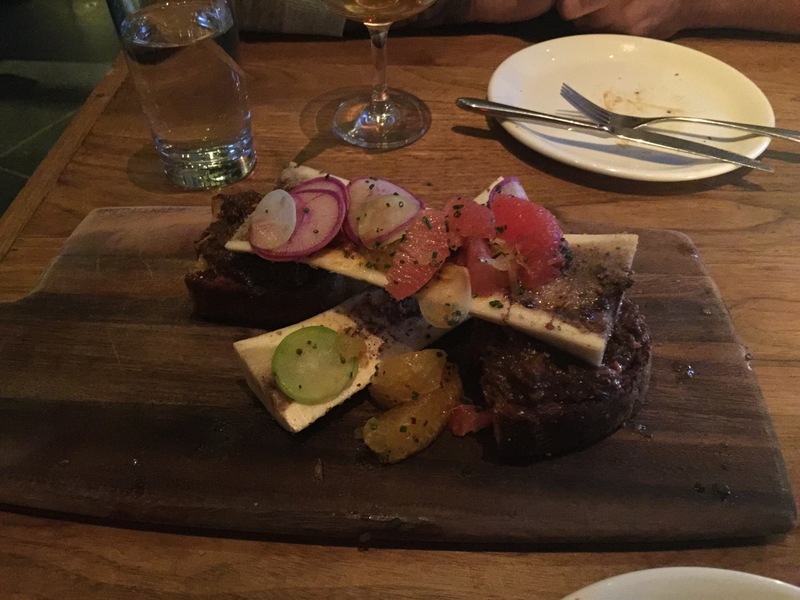 Usually a bone marrow dish comes with a nice toasted bread to smear the marrow on – kind of like a butter. This time, it came with a toasted bread with beef cheek marmalade: the best thing I have ever eaten when combined with the marrow. So sweet and savory and heavy, but not too heavy. Even perfecter than every other perfect dish. 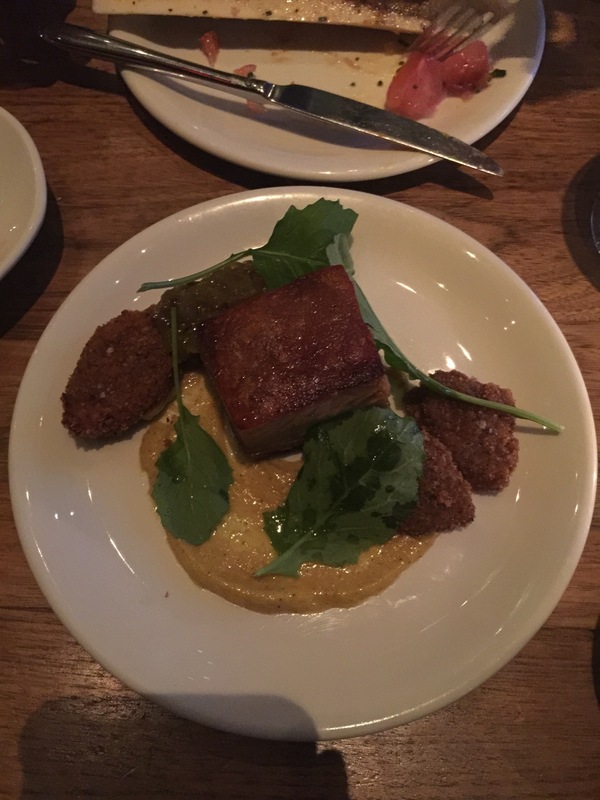 This was the pork belly with fried green tomatoes and a curry flavor infused in the puree and tomatoes. Despite being probably the best pork belly I have ever had, with perfectly crispy skin and amazingly tender meat, this was my least favorite dish of the dinner. Having to choose a least favorite out of such awesomeness gives me an uneasy and guilty feeling: it isn’t fair to that pork belly to be so good and yet last on the list. This is the sign of a five star Bacoboozer rating. This was the grilled veal sweetbreads. Now, I’m not sure if I’ve ever mentioned this on my blog, but the single only food that I despise is celery. I will eat hearts and glands and brains, but I can’t stomach the thought of celery. 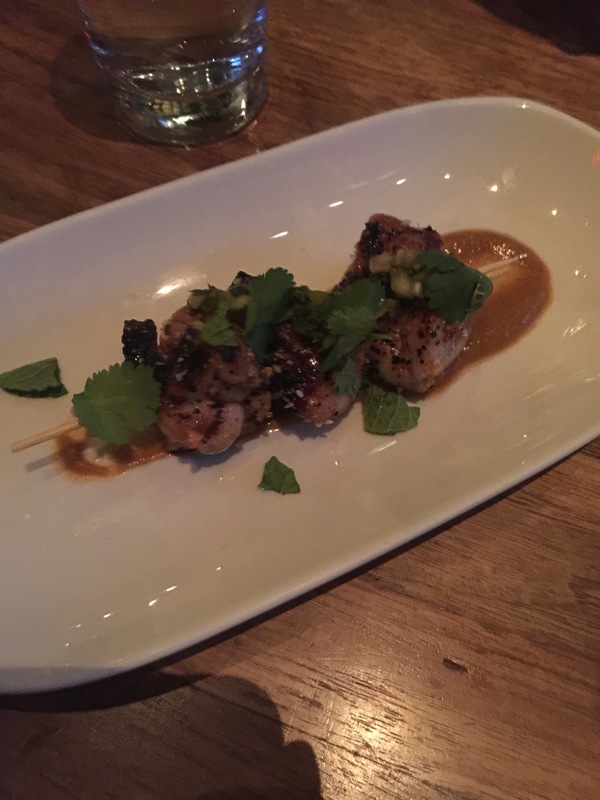 These sweetbreads were celery infused, and somehow I managed to not only eat my portion, but also still steal the last bite from Justin. Yet another sign of a five star rating. 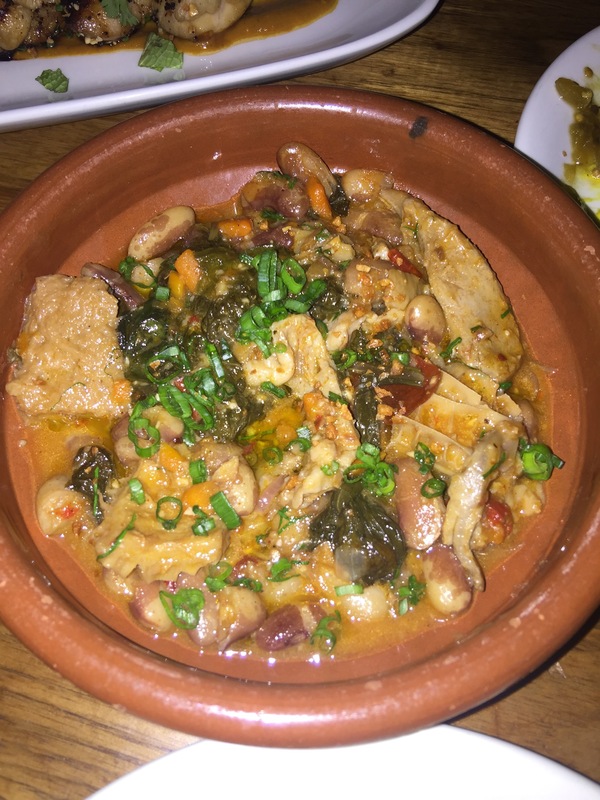 Our last course of the meal was the callos: tripe and marfaix bean stew. Tripe is always iffy for me: sometimes I love it and sometimes, not so much. 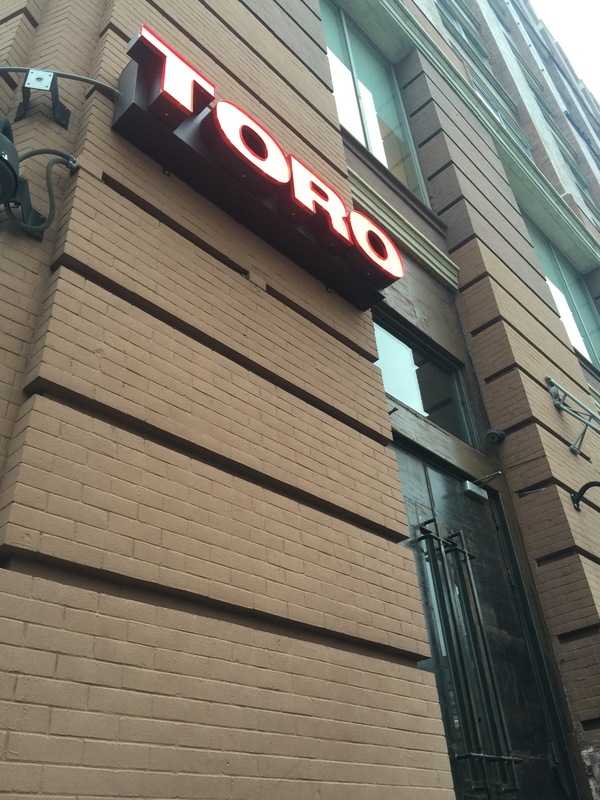 But again, Toro amazed me. It wasn’t too chewy and wasn’t too strong tasting. The stew infused perfectly into the tripe giving it a lighter taste than I would expect. Perfect. This was Justin’s favorite dish of the meal. During our meal, we finished our cocktails and allowed the waitress choose a “mid priced” red wine, giving her the direction that I usually go for a pinot noir or something a little lighter. 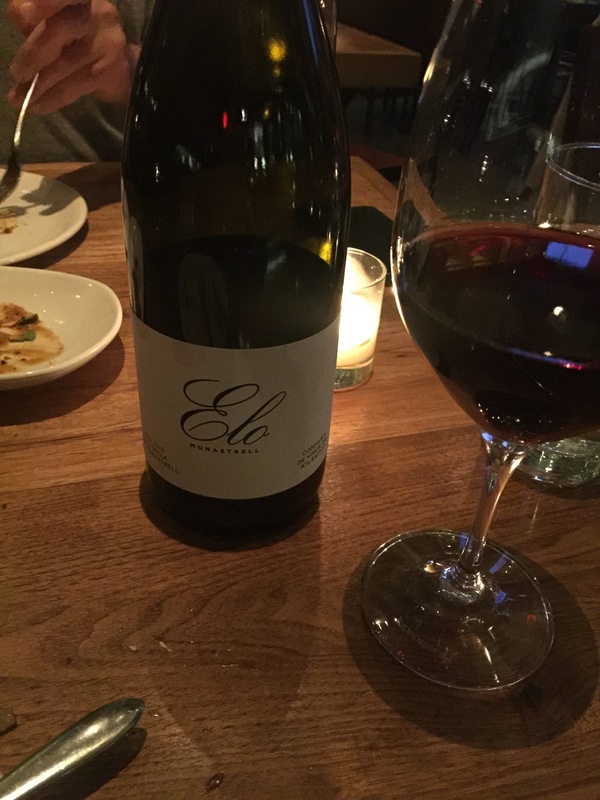 This Elo Monastrell was what she went with at $72 a bottle, with was indeed average for the restaurant, with bottles ranging from high 40s to well over 100. The wine was perfect. Last, we obviously saved room for dessert. 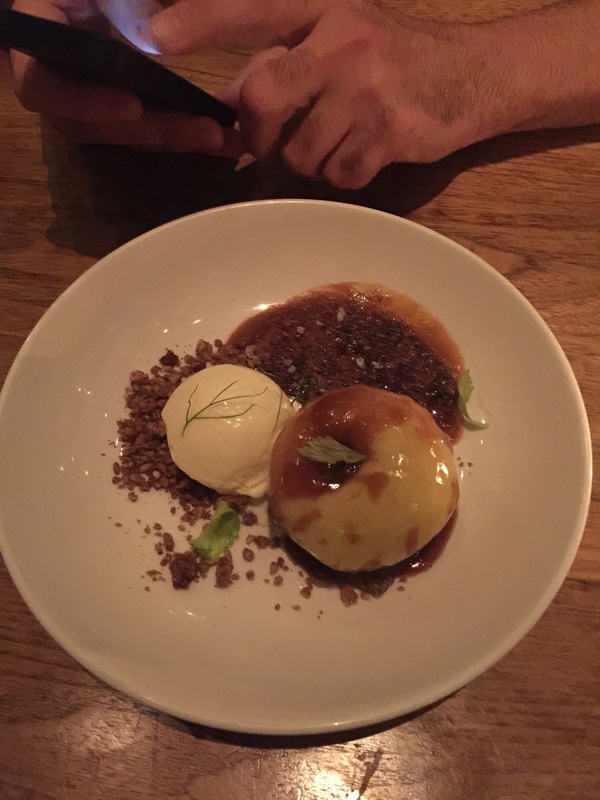 The three choices were a chocolate cremeux, churros, or a poached apple with creme brûlée and goat cheese ice cream, which is what we chose, pictured above. For me, dessert is always a restaurant’s opportunity to really stand out. There are always the standard dessert options: chocolate flour less cake, gelatos and ice creams, basic creme brûlées, etc. But I think it takes a lot for a restaurant to come up with innovative desserts, which is what was achieved here. I was worried about that goat cheese ice cream; how could that possibly taste good? And yet, somehow, while still tasting exactly like goat cheese, it tasted amazing. And I’ve never had such an unusual take on creme brûlée: not so much creme and heavy on the brûlée, it was outrageous. The apple tied everything together. Every bite seemed complete. 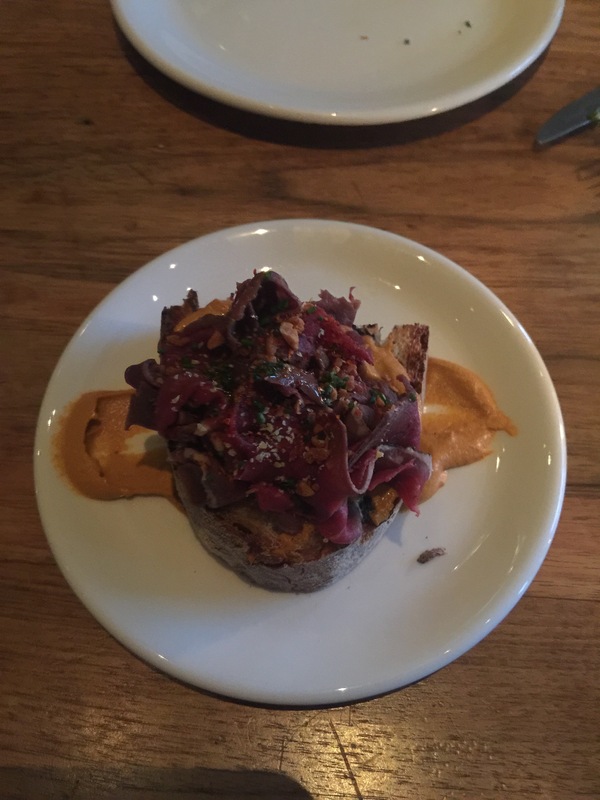 So yes, as I’ve alluded to already, Toro did it: my very first five star Baconboozer rating! Every single bite of this meal was not only delicious but surprising. I felt like the meal taught me something about each of the ingredients I tried. Service was excellent: helpful and friendly without being over dramatic or overbearing. The menu had enough options to satisfy Justin and myself – adventurous eaters – but could also easily feed a modest eater as well, with plenty of chicken, beef, and vegetarian options that still seem inventive and enticing. And having such an extensive menu only leaves me wanting to come back to try more; I mean, I need to try the ham and pigs head fritters asap. 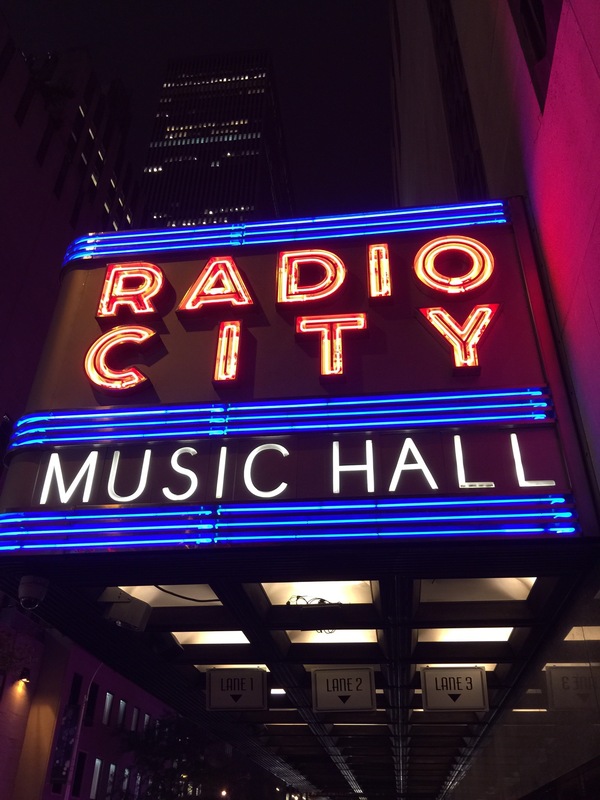 After the glorious meal, we grabbed an Uber up to Radio City Music Hall for the Bastille concert. A band I had never heard of – Grizfolk – opened and was really great and engaging, getting everyone ready for the main act. And despite being in a nearly debilitating food coma, Bastille still managed to impress me. The English band’s lead singer – Dan Smith – came off as quirky and modest, thanking fans extensively after every single song. They saved their hits, Pompeii and (more recently) Flaws for the encore, but I’m a big fan of their whole album, Bad Blood. They also released a cover album “Other People’s Heartache” a few years back, with an awesome cover of No Scrubs which they played, and I’ve been obsessed with for a few years now. I love the incorporation of clips from Psycho throughout the song, and loved the darker theme of their version. It’s not available on iTunes, but you can find it pretty easily on that magical thing they call the internet. So there you have it: my first five star Baconboozer rating awarded to Toro followed by an outstanding musical experience at the iconic Radio City Music Hall. You couldn’t be a prouder New Yorker than I am, writing this, right now.